You are here: Home / Foot Care Blog / Toenail Fungus / Am I At Risk For Toenail Fungus? 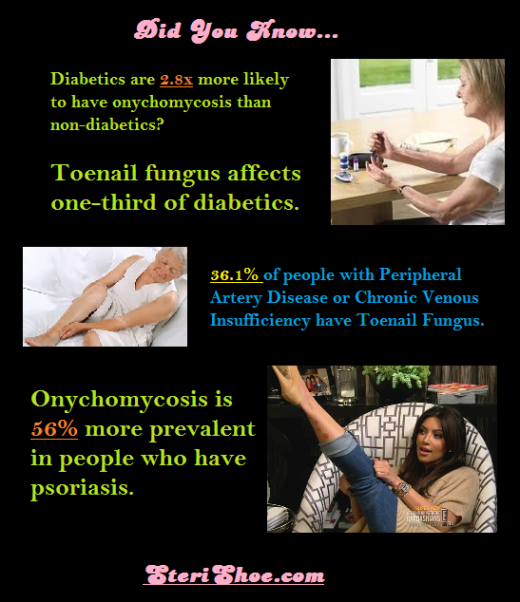 July 9, 2013 /3 Comments/in Toenail Fungus /by Jenn F.
It seems like some people suffer from recurring toenail fungus continuously throughout their lives, while others seem immune. Though onychomycosis toenail fungus is contagious, there have been many cases where people living in the same household, stepping on the same contaminated surfaces, do not contract the harmful fungus from their housemates. In today’s post, we’ll talk about some of the known risk factors for toenail fungus and what you can do to minimize your chances of getting it. Scientists have discovered genetic links to a person’s propensity to contract toenail fungus. “If you’re a person who’s not going to get it, you’re not going to get it–you could walk through a field of it,” says Dr. Monica Lawry, a Sacramento nail specialist. As we age, there is decreased blood circulation and slower wound healing, more years of exposure to fungi, and slower-growing nails. These factors make people over the age of 60 more likely to develop foot fungus. It’s estimated that up to 30% of the population will get onychomycosis by age 60. Men are affected by toenail fungus twice as often as women. The precise reasons why are not well understood. Individuals with ulcers, recurring athlete’s foot, skin aberrations, blisters, ingrown toenails, or weakened immune systems are more susceptible to harmful foot fungus. Our feet are naturally covered in fungus, which doesn’t necessarily infect us or become problematic — unless there is some type of cut or other entry-point into the body. People with autoimmune disorders like psoriasis, ulcerative colitis, Crohn’s disease, inflammatory bowel disease, lupus, AIDS, cancer or diabetes are also less likely to ward off attacks from foot fungus. Long-time steroid use may weaken the body’s defenses. People who perspire a lot, do not wash their feet daily, or wear wet socks can be more prone to foot fungus, since the microbes thrive in a moist, warm environment. Wearing socks or shoes that have poor ventilation or are too tight can also increase the risk. You’ll want to alternate pairs of shoes to allow proper drying time and sanitize your footwear using the SteriShoe UV light shoe sanitizer to kill off 99.9% of the fungus living in your shoes. Also, avoid walking barefoot in public showers, gyms or pools. A lot of people are.. Easy to get rid of though. Great article, I liked how you broke down the types of fungus, even including White Superficial. The two most common bacteria that cause nail fungus are Dermatophytes and Tricophyton rubum, which develop underneath the nail of the bed. Treatment is difficult, because of the nature of the fungus underneath the nail it’s hard to directly apply a topical treatment. Overtime, certain topicals can help to destroy the debris that develop under the nail and encourage fungus to grow and spread and also help eliminate the fungus at its source while healthy nail regrows.